As the spring semester comes to a close, the George Washington University School of Medicine and Health Sciences (SMHS) hosted a pair of events designed to allow students to let their hair down: Family Tree Day and Follies. March 23 marked the third annual M.D. program, Family Tree Day. For “generations,” SMHS has paired first-year medical students with second-year students as part of the Big Sib/Little Sib program to help ease the transition to medical school, as well as to life in Washington, D.C. Through Family Tree Day, those sibs—often in each level in the medical school—come together to meet their extended SMHS family members. Gathering in rooms throughout Ross Hall, students spent time getting to know each other, sharing advice, and enjoying a catered lunch. 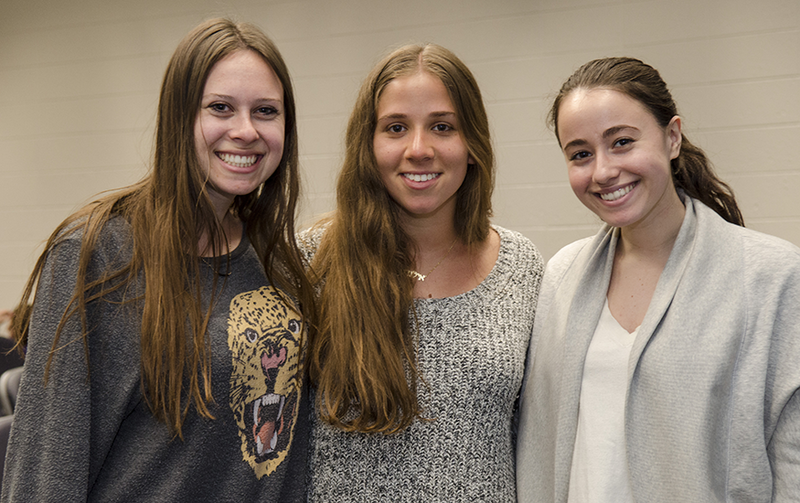 One such family was fourth-year, Rachel Schoenbrun; second-year Alana Siev; and Samara Levin and Leora Aizman, both first-year students. Students received questionnaires, which were used to match them up based on interests and personal experiences, Siev said, explaining how the four came together. Although “today is the first time a lot of the families have met each other,” Aizman said, family members swapped phone numbers and discussed the possibility of getting together one more time before saying goodbye to Schoenbrun, who will graduate in May and begin her OB/GYN residency at Mount Sinai in New York City. Follies is a time-honored tradition, organized and hosted by the students themselves. The variety show-style event puts the students on display as they perform for their peers. It also features an opportunity for the classes to celebrate their favorite faculty members with the presentation of the Golden Apple Awards. “It’s always so impressive to see the talent of my classmates since we don’t have a chance to show our ‘creative side’ very often during our regular medical school curriculum,” said fourth-year M.D. student Arielle Katcher, executive director of this year’s Follies. Katcher began planning the show a week after the 2016 event, and the students began planning their performance material in December. Each class has the opportunity to produce material; this year’s comedy-driven show featured live music, with a band performing a couple of parody song; pre-filmed skits and joke advertisements, and live skits. One particular crowd-pleaser was “Medical Student on a Tinder Date.” The fourth-year M.D. students’ portion was delivered in a Saturday Night Live-esque performance, including a political cold opening and cast credit montage. During intermission, SMHS students presented the Golden Apple Awards to faculty members who have had a significant impact on their education. First-year medical students voted for Zhiyong Han, Ph.D., associate professor of biochemistry and molecular medicine, and second-year M.D. students selected Marie Almira-Suarez, M.D., assistant professor of pathology, to take home their apples. Third-year M.D. students picked Kristin Gorelik, M.D., assistant professor of obstetrics and gynecology, and the fourth-years awarded their golden apple to Kathleen Calabrese, M.D. ’08, assistant professor of emergency medicine. The physical therapy class of 2018 chose Holly Jonely, D.P.T., assistant professor of physical therapy and health care sciences, while the class of 2019 voted for Margaret Plack, D.P.T., Ed.D., professor of physical therapy and health care sciences. At the end of the show, fourth-year students crowded the stage with homemade signs showing where they matched for their residencies.